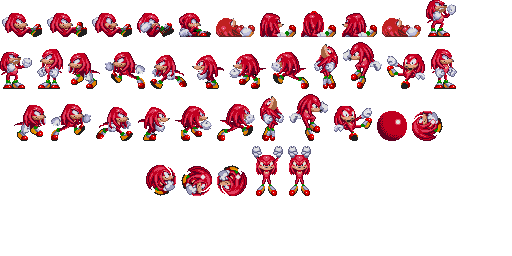 I've been dabbling with sprites, and I've found most sprite sheets that have been posted for existing games (for example, Sonic & Knuckles) are not aligned to a grid. I've found this frustrating when trying to use these sheets to set up animations in Unity. I managed to align the spritesheet above manually, but it took a while and I'm wondering if anyone has tips on how to make this process easier/faster? Not the answer you're looking for? Browse other questions tagged 2d animation sprites spritesheet or ask your own question. How can I handle sprite sheets with nonuniform sprite dimensions? How powerful is modern hardware for complex, intensive 2D graphics? Advanced Animation for 2d Isometric Game? How can I dynamically load the correct sprite from a sprite sheet? How to code sprite sheets? How do I make perfect sprite sheets?